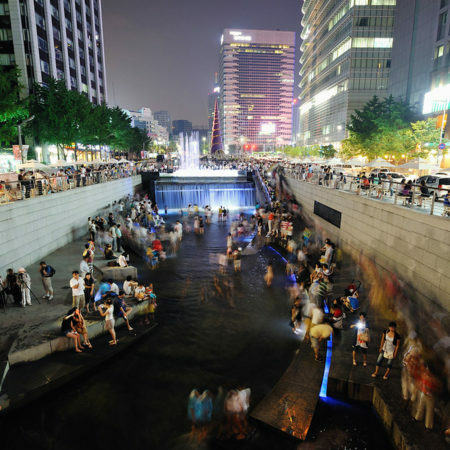 At Mikyoung Kim Design, we believe innovation in design emerges from a team approach that is collaborative and synergistic; working together to develop new solutions to the complex challenges, within the public realm, that face us today. 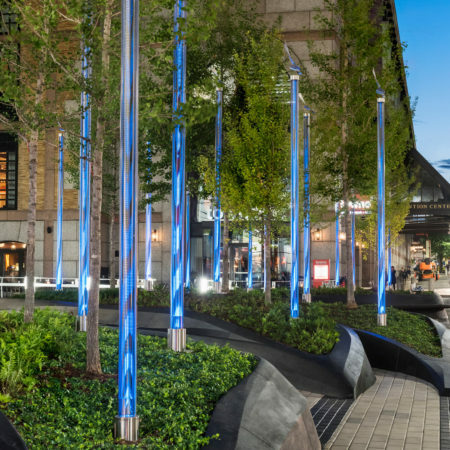 For over two decades, our firm has partnered with clients throughout the U.S. and across the globe to develop site specifics, sustainable, and artistic planning and design solutions. 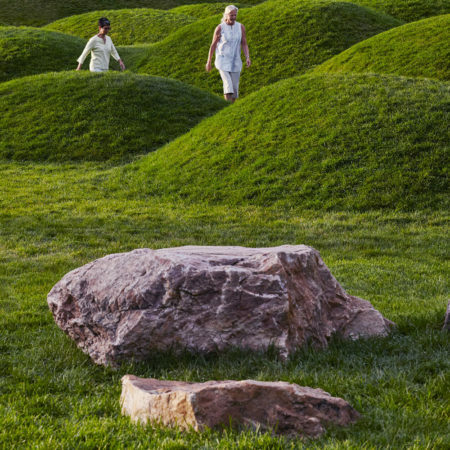 Our focus is in choreographing the visitor experience and creating a design vision that allows for flexible programming; from the whimsical to the contemplative. 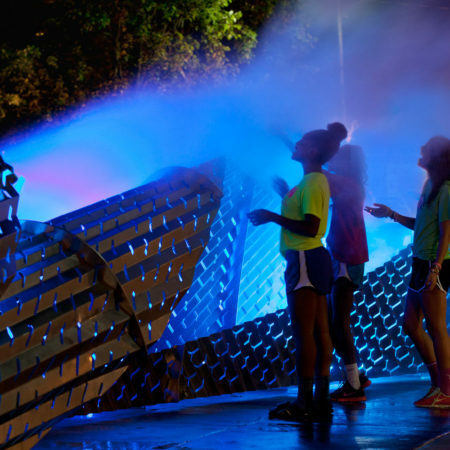 Our work addresses pressing social and environmental issues while celebrating the beauty of our collective human experience through the use of contemporary materials and technologies. 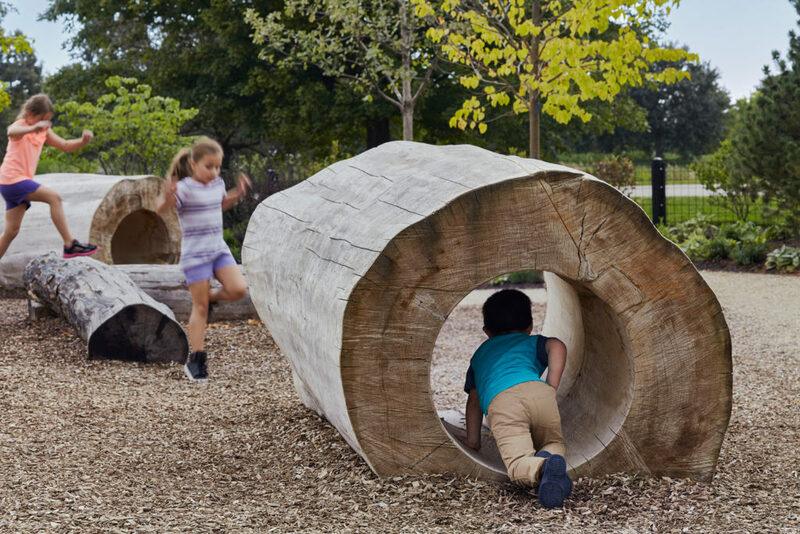 Today, the work of Mikyoung Kim Design is defined by a seasoned understanding of material detailing and a whimsical celebration of the transformative and healing power of the natural world. 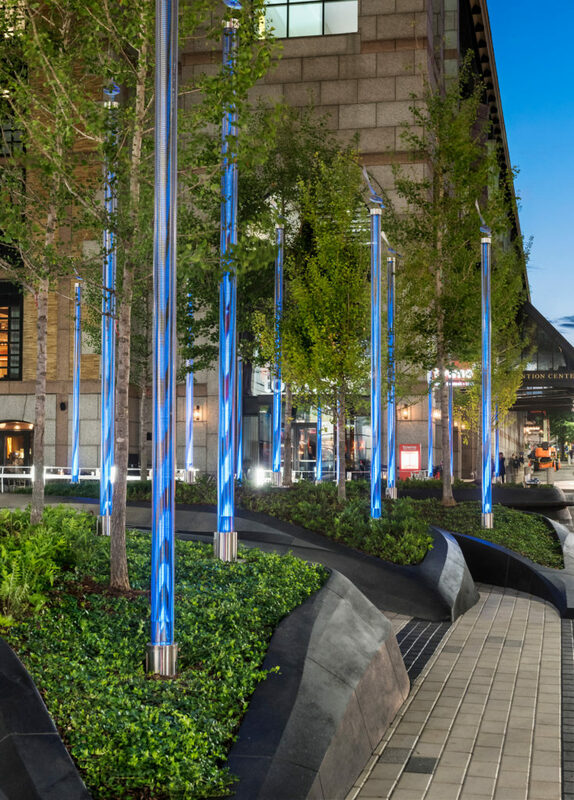 Each project within our extensive body of work is comprised of choreographed spaces that are sensitive to the environment and generated through an artistic, community-responsive design. 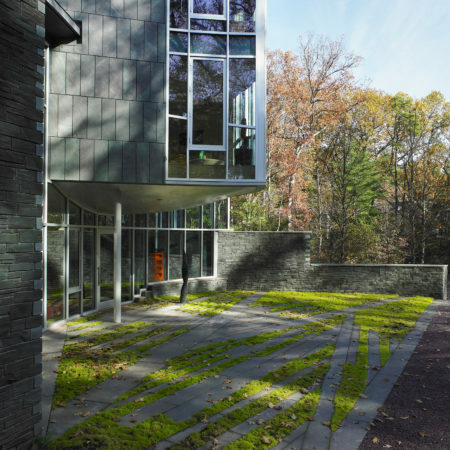 The studio’s projects meld environmental design, sculpture and sustainable initiatives to develop engaging and poetic works of art. 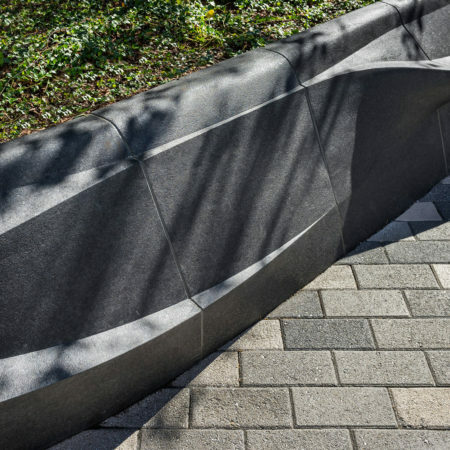 The designs are meant to heal the rifts between nature and humans and reveal the embodied meanings behind natural materials. 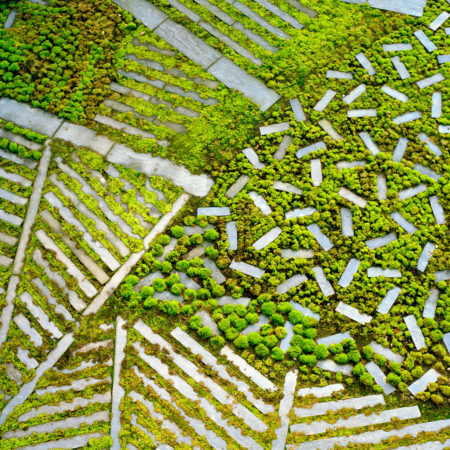 Our work is inspired by the unique aspirations of the community. 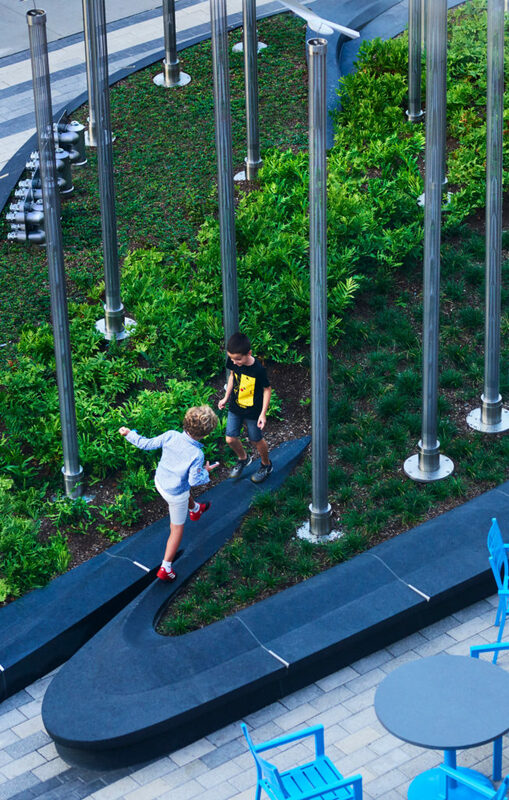 Each project reflects the complex cultural identity of each neighborhood, creating civic spaces that celebrate the transforming nature of the cities, both culturally and ecologically. 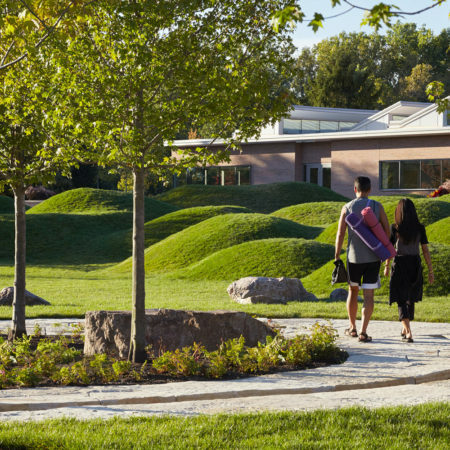 From day to night, wet to dry, and season to season, Mikyoung Kim Design creates a vibrancy that enlivens communities and celebrates the collective human experience. 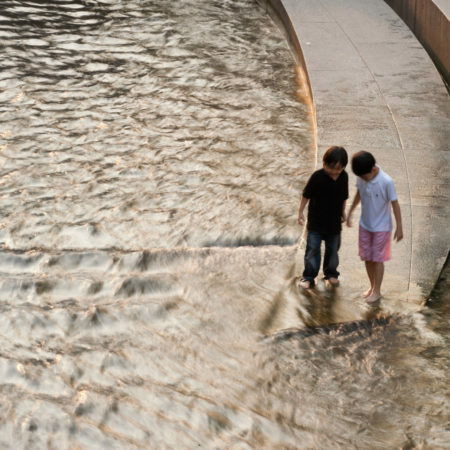 Our work begins by listening to our clients and the communities that we serve. 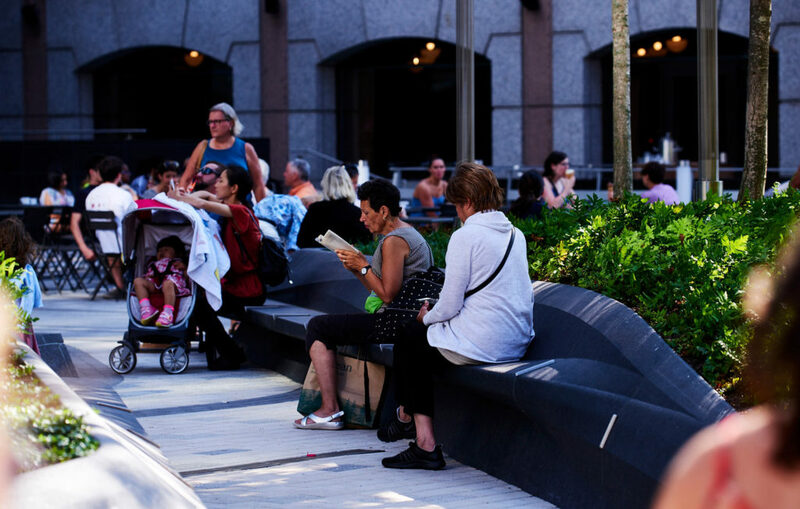 Through the life of a project, we find that an integrated community engagement process helps us to understand fresh new perspectives about placemaking. 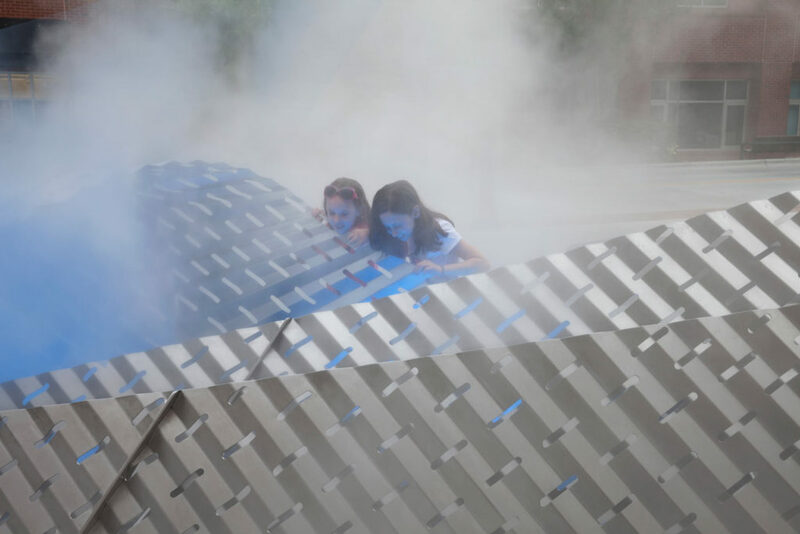 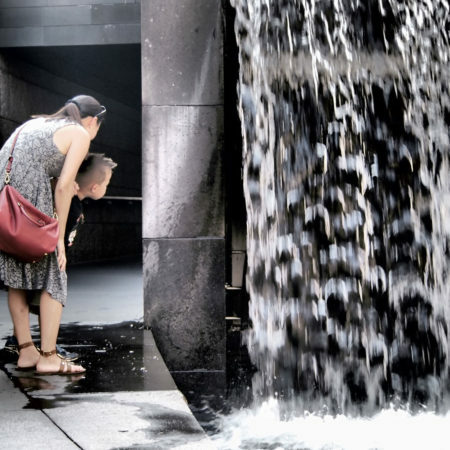 Our work is about finding new ways to see, hear, smell and touch design in the public realm, demonstrating the importance of good design by providing desirable spaces for the community to engage with art, with each other, and with the world around them. 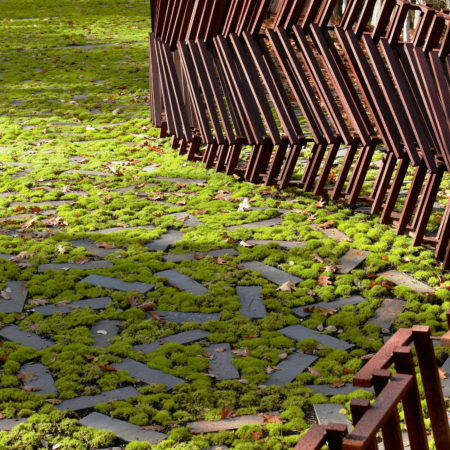 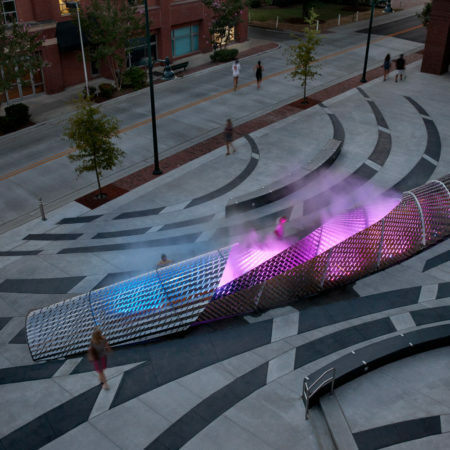 Mikyoung Kim Design functions as an idea lab; it is a think tank of innovative landscape architects, architects, graphic designers, and artists. 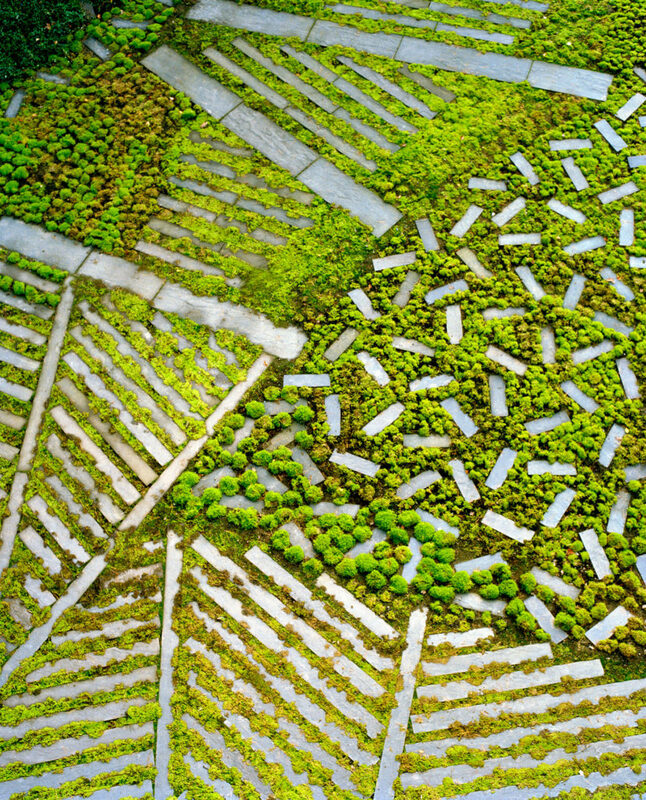 As a multi-disciplinary office our ideas emerge through a responsive and collaborative approach that imagines possibilities across disciplines. 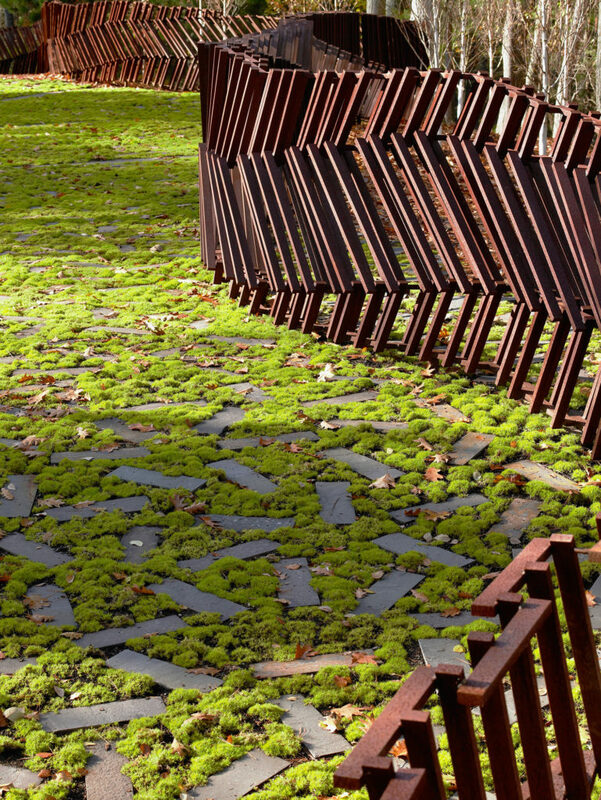 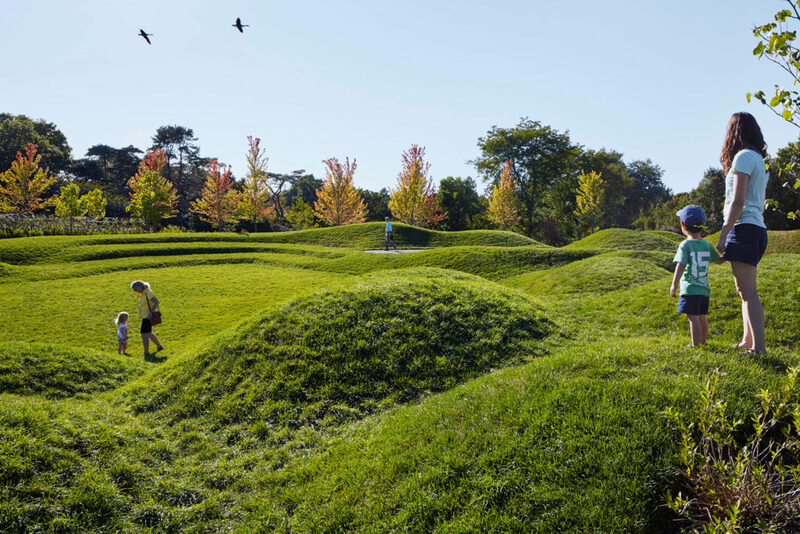 Our diverse backgrounds have shaped our body of work, blurring the boundaries between landscape architecture and environmental art. 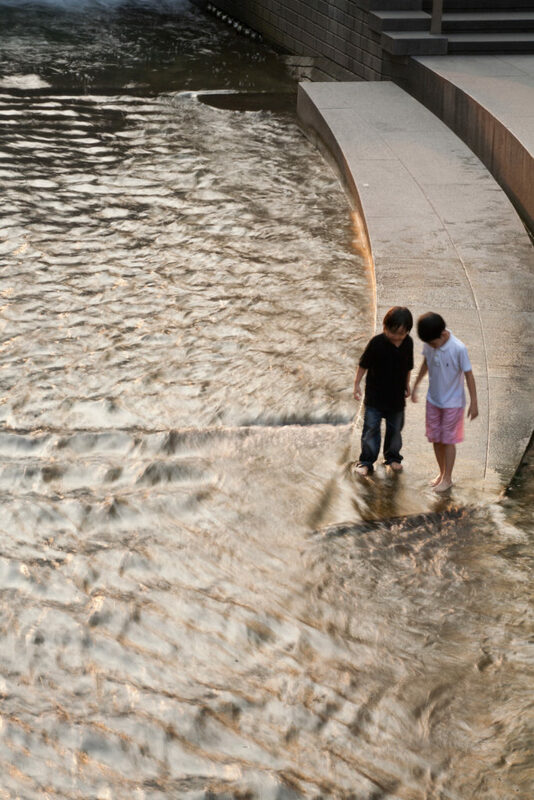 From children’s playgrounds to city parks and urban master plans, Mikyoung Kim Design’s work reflects a deep commitment to memorable place making that captures the public imagination. 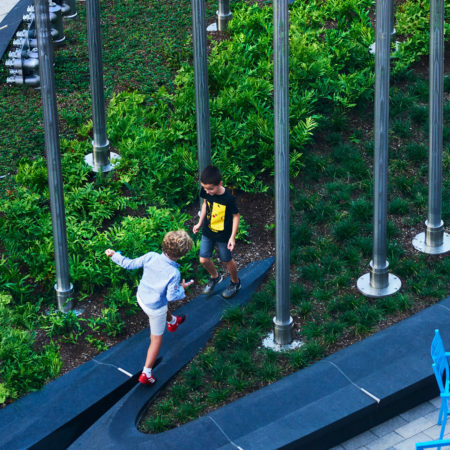 Our landscapes bring a richly layered civic experience to the public realm that engages the senses for a multi-generational audience. 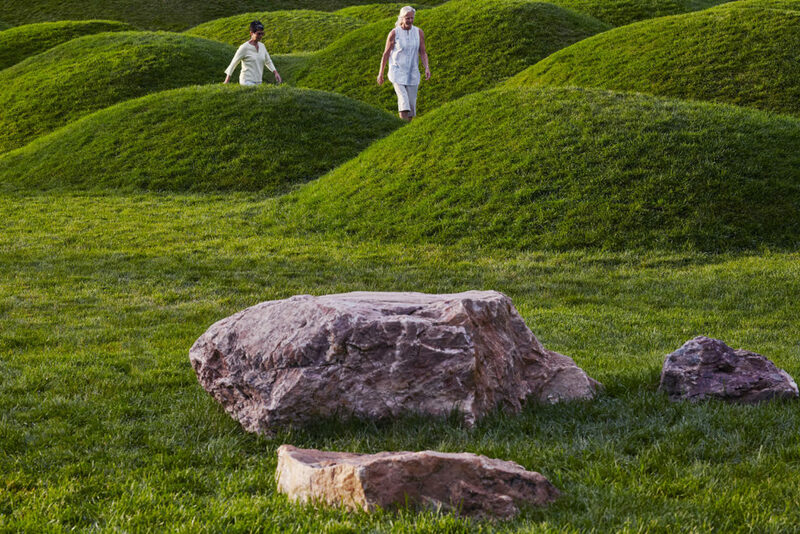 We embrace a collaborative approach to design that results in poetic and timeless landscapes. We believe that our unconventional artistic vision creates experiences that inhabit the intersection of art and science, beauty and innovation. 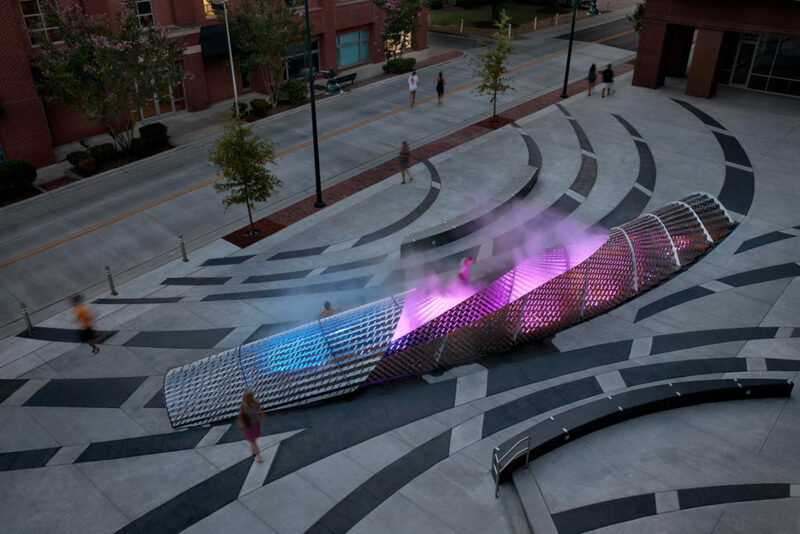 MYKD has created spatial narratives that encourage public interaction and question perceptions of space with color and light. 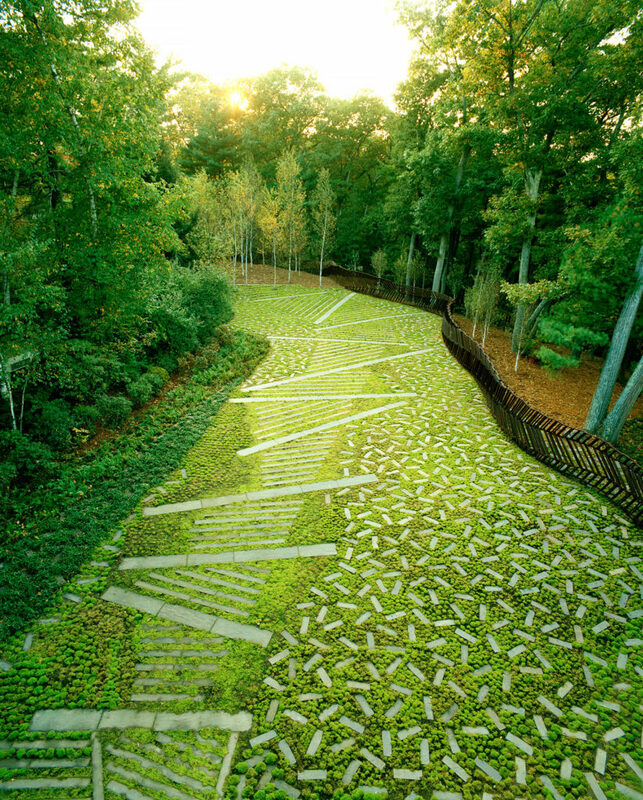 A hallmark of our work is the integration of sculptural innovation with the ecological systems that shape the landscape. 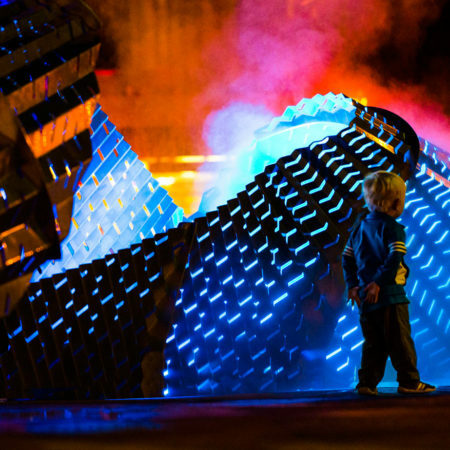 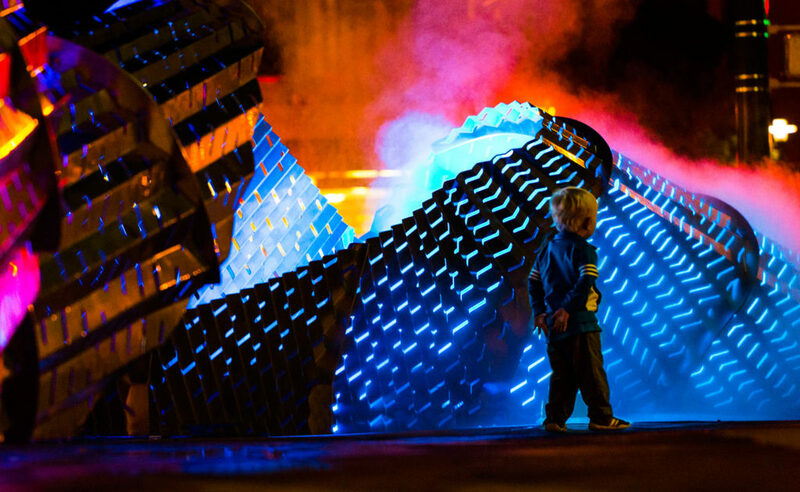 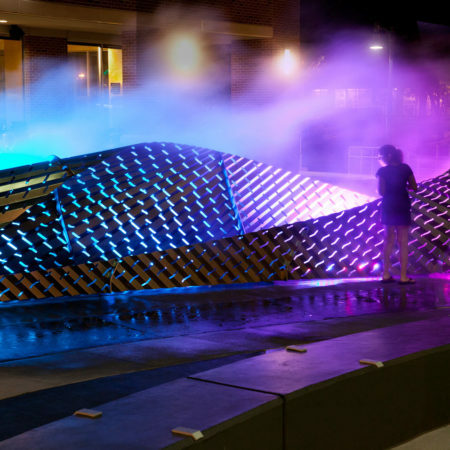 It encompasses a wide range of interests; from integrated landscape experiences to holographic murals. 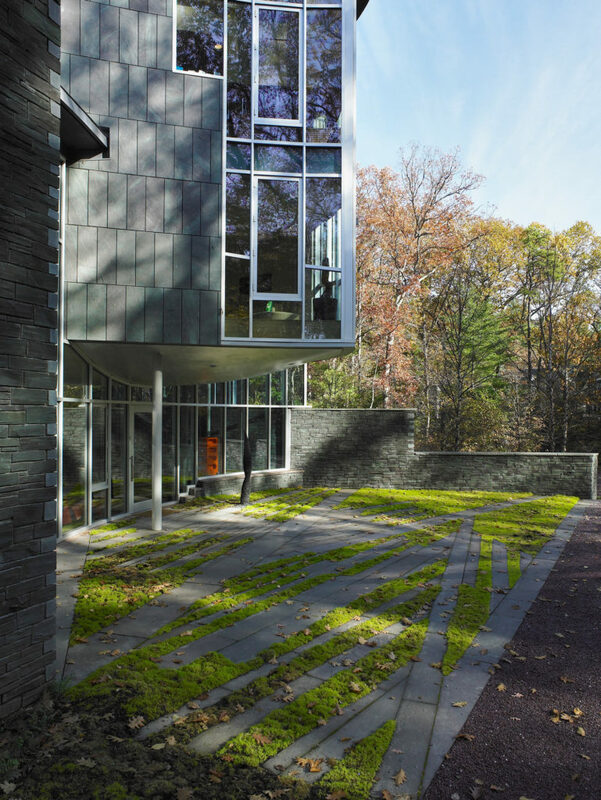 Mikyoung Kim’s Design approach can be distilled down to two main ideas: maintain clear communication and meet expectations with a high standard of excellence. 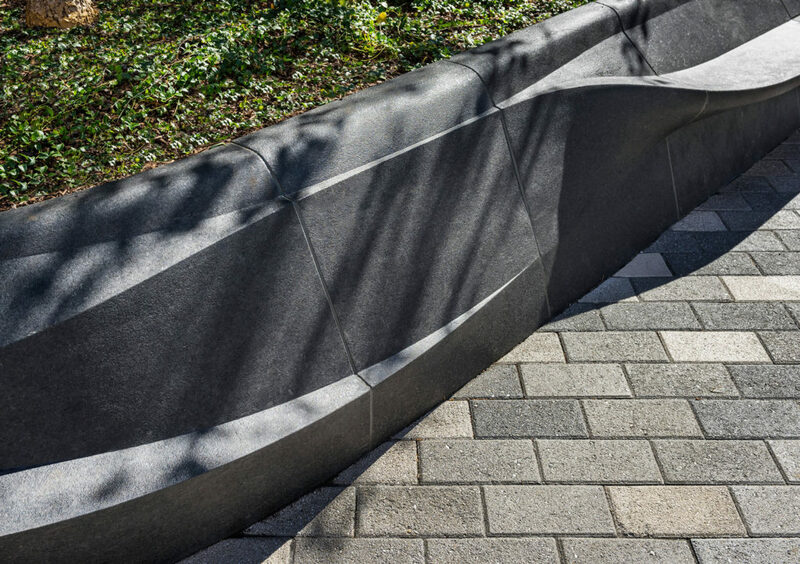 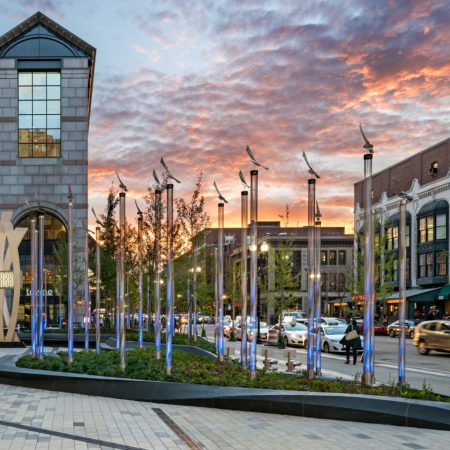 Located in the heart of Boston’s historic Back Bay neighborhood, the Prudential Center Plaza is a sustainably designed civic space that was inspired by the site’s wind patterns. 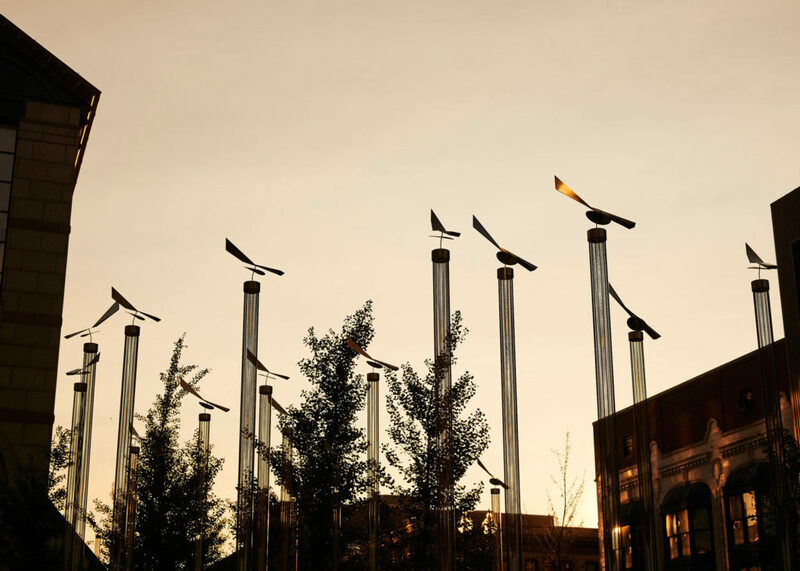 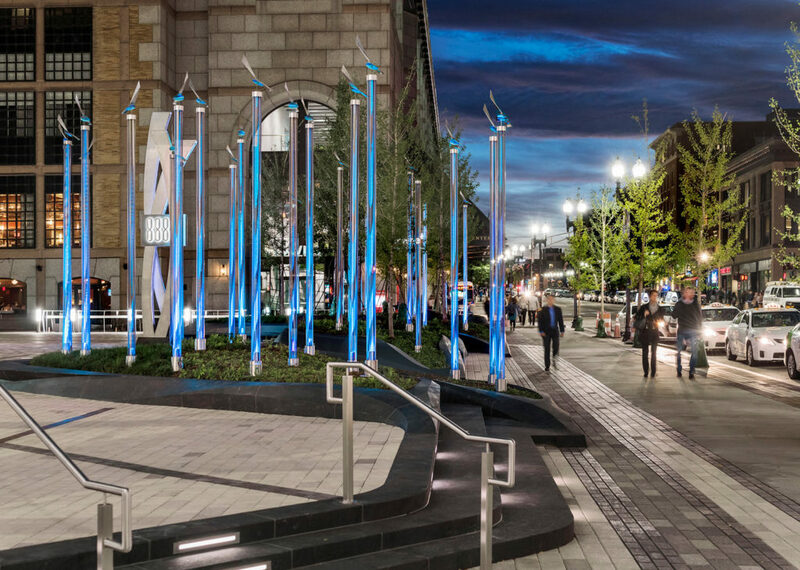 Innovative elements of this plaza include a complex gradient paving pattern, sculptural “wind swept” granite planters, and a grove of stainless steel light masts that feature color changing lights that are programmed to a weather sensor, each capped with a sculptural wind vane. 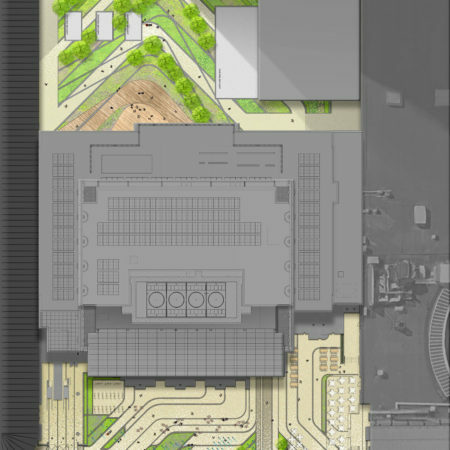 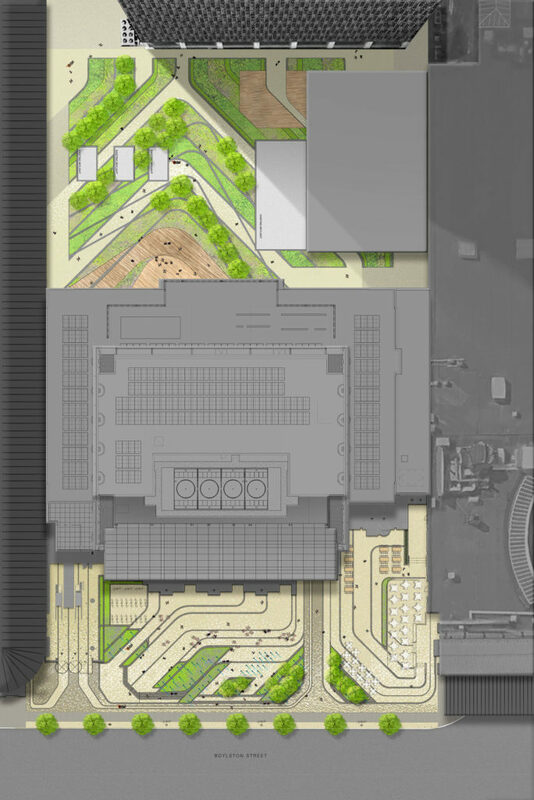 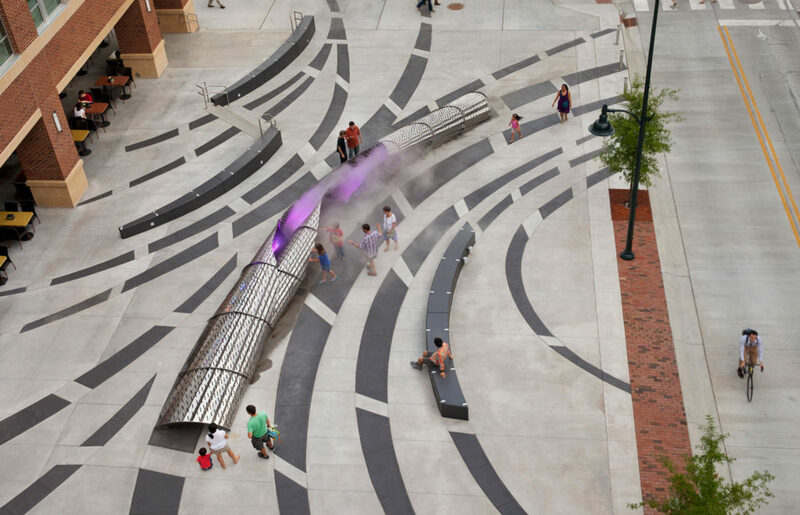 Together these elements complete a conceptual vision of material innovation that highlights the phenomena of wind on the site, transforming the plaza into a living wind diagram. 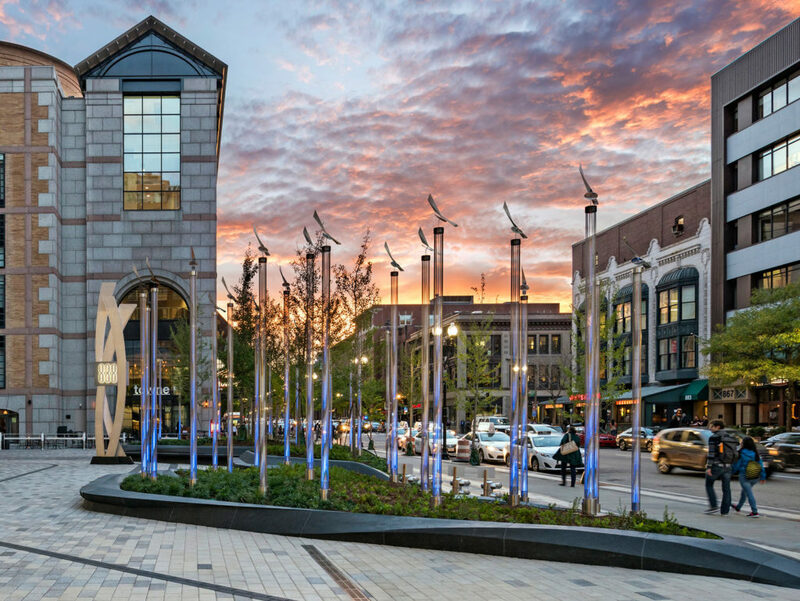 The plaza, designed in conjunction with the new 888 Boylston Street building, serves as greeting space, an entrance foyer, public gathering space, and event space that functions to provide year-round flexible programming. 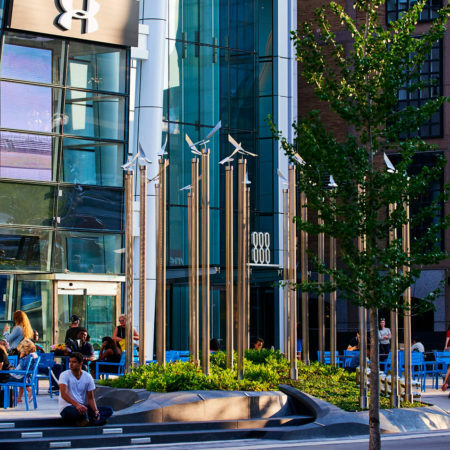 Credited as one of the most sustainable office buildings in New England, the LEED Platinum 888 Boylston Street tower features green roofs, rain gardens, wind turbines, and solar panels that help power and irrigate the landscape. 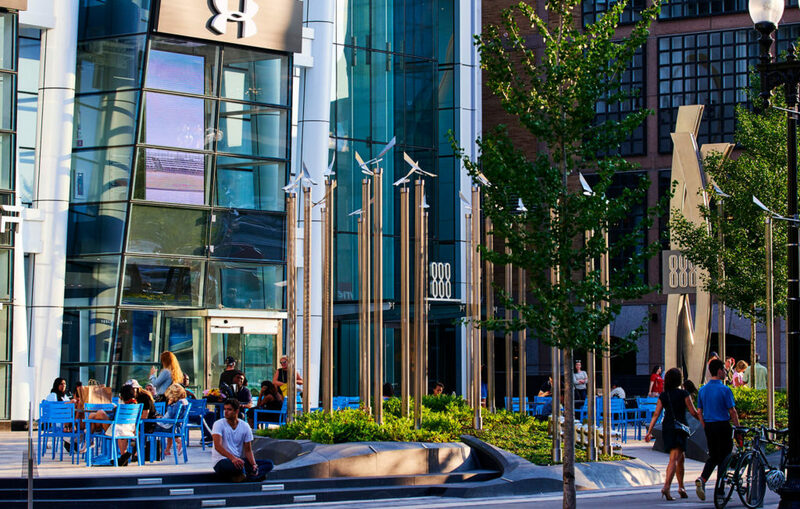 Once an underutilized stepped plaza, the new Prudential Center Plaza has improved access to adjacent office, retail, and dining establishments and has become a public epicenter of community gathering and civic activity. 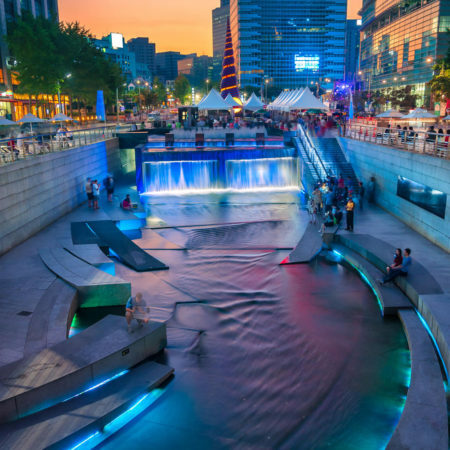 The ChonGae River Restoration Project is an ambitious redevelopment initiative that transformed the urban fabric of Seoul, Korea. 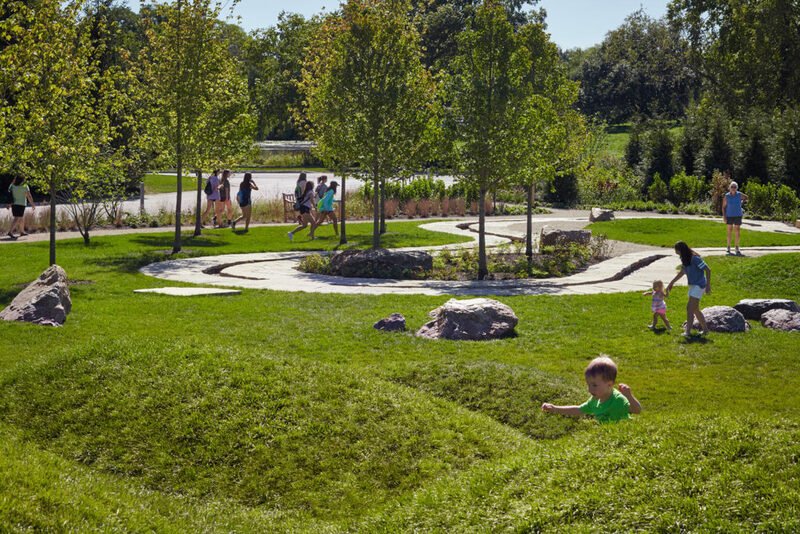 This design was the winning project in an international competition celebrating the source point of cleansed surficial and sub grade runoff from the city at the start of a seven-mile green corridor. 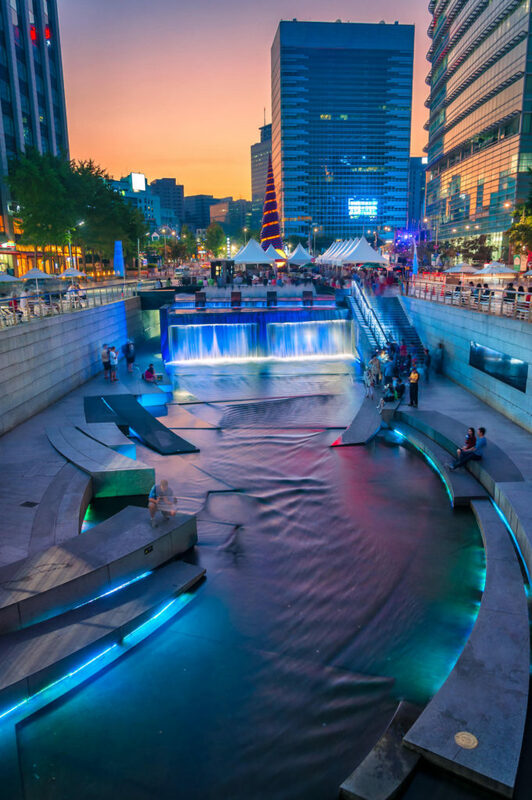 The charge of the international design competition for this project was to create a symbolic representation of the future reunification of North and South Korea within this two block urban park. 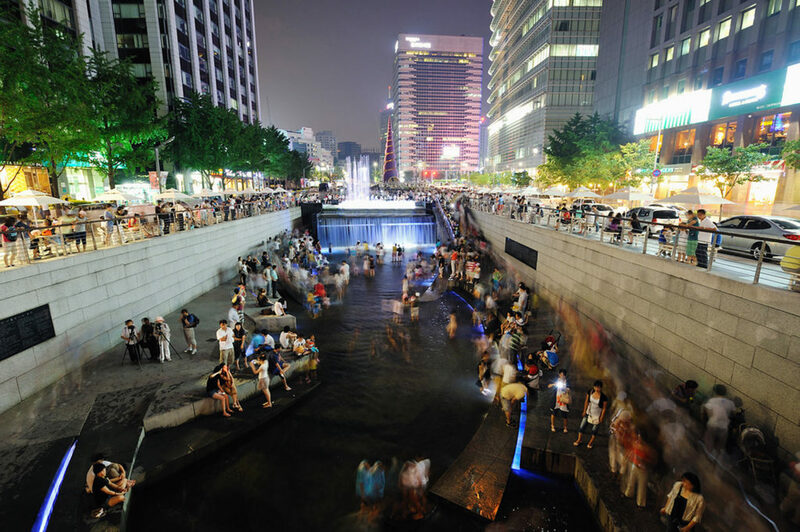 The nine provinces of both Koreas contributed local stones to make up the nine stone planks that serve as individual water sources and allow for nine access points to the waterway, guided by fiber optic light at night. 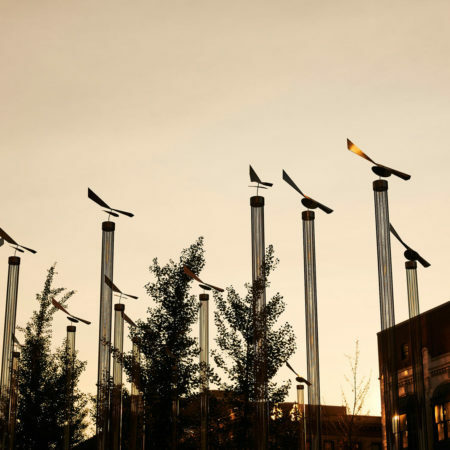 The restoration of this area is the first step in a major redevelopment effort of this seven-mile corridor and current ambitious architectural redevelopment projects that frame this natural drainage basin to the city. 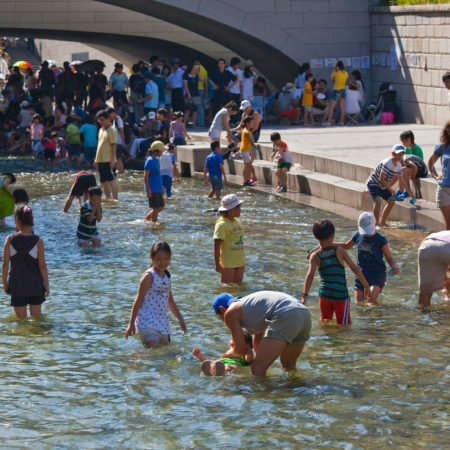 The project, as a whole, has been effective in decreasing air pollution and the heat island phenomenon that existed in this area prior to the renovation of the river. 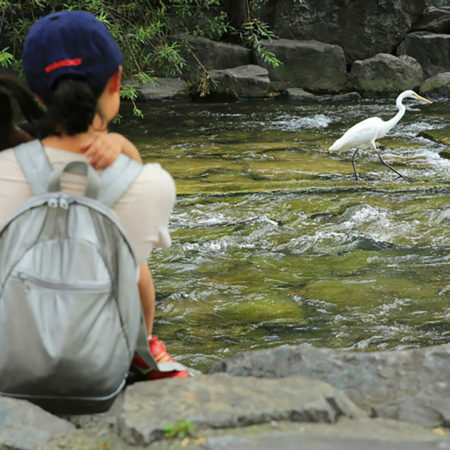 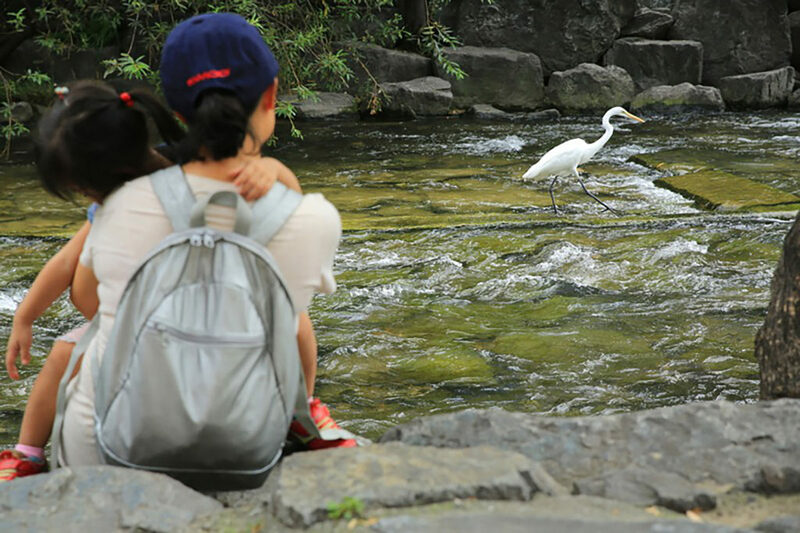 The ecosystem of the Cheonggyecheon Stream is encouraging over 213 new species of birds and fish and plant life in the area. 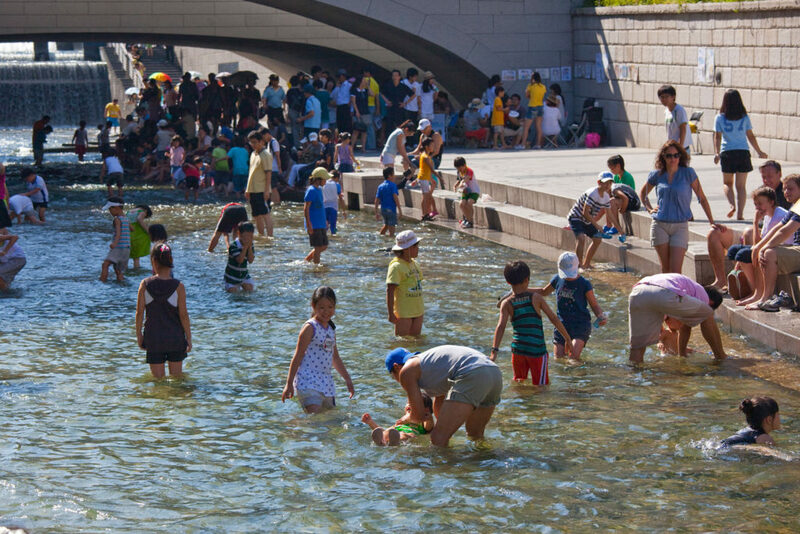 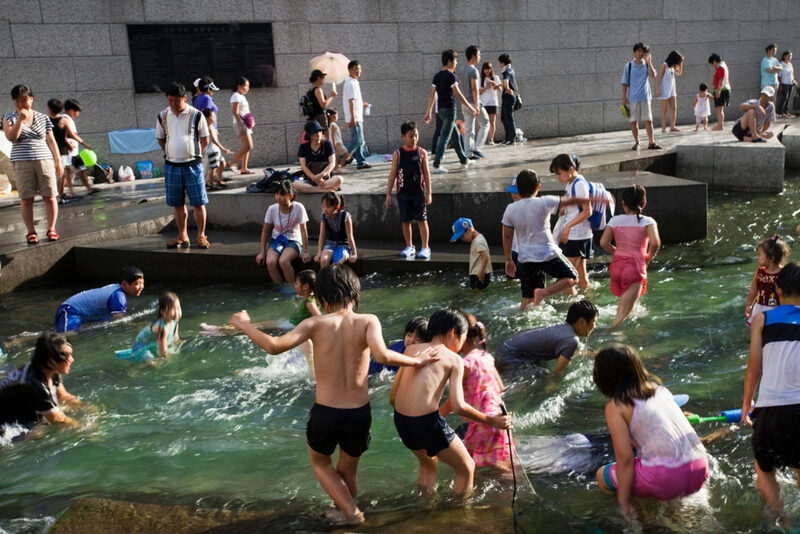 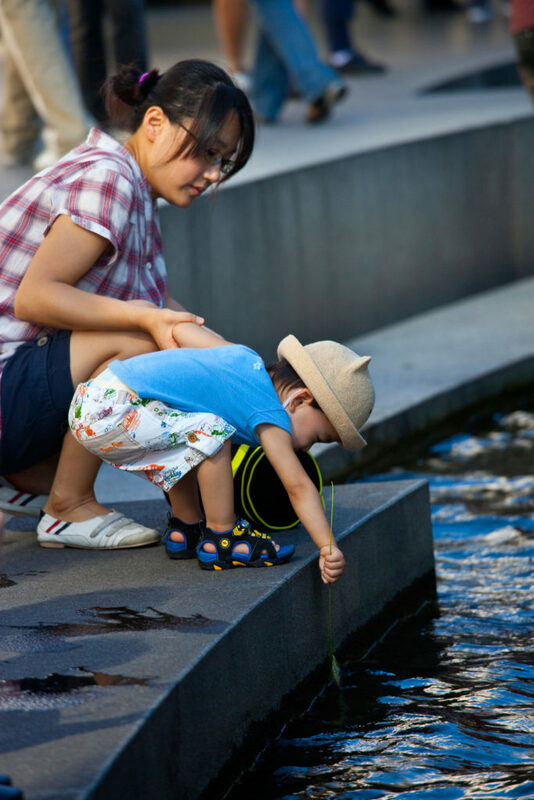 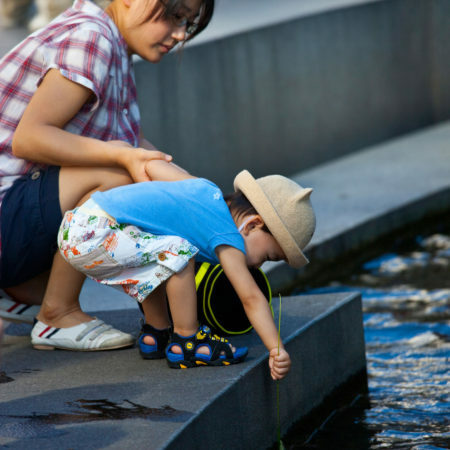 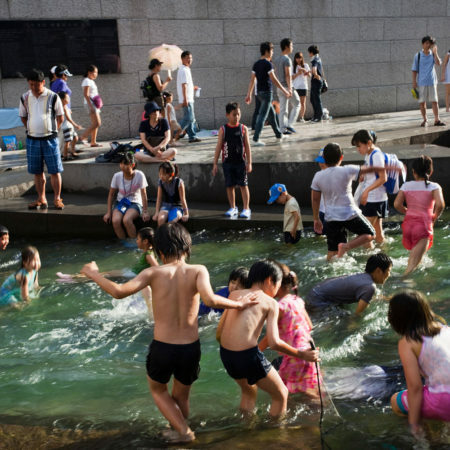 The purification system has allowed for the public to safely reengage directly with the water, so that this urban open space has become a central gathering place for the city which is in dire need of more public landscapes. 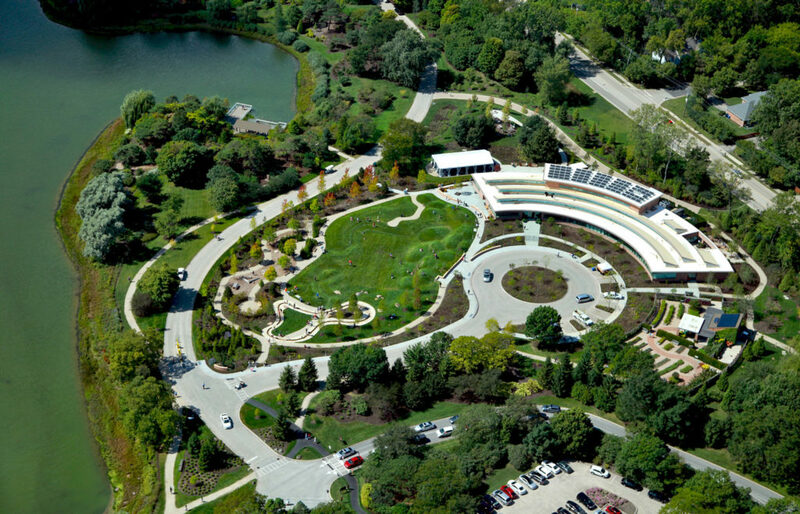 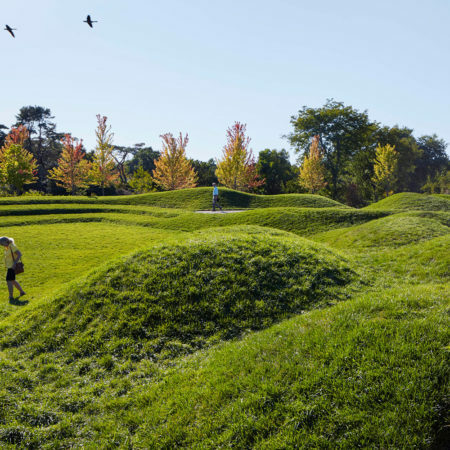 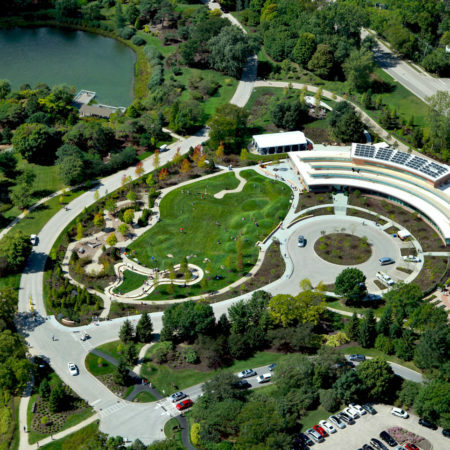 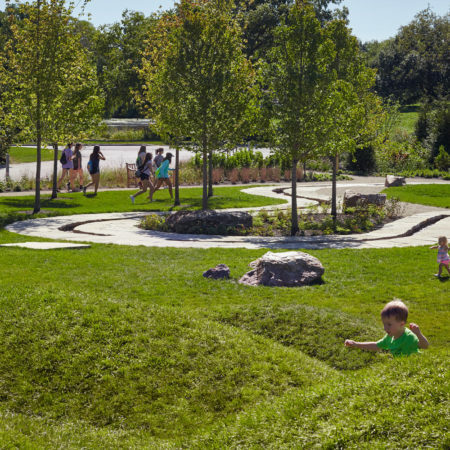 The Regenstein Learning Campus is a new environmental discovery center and nature playground at the Chicago Botanic Garden. 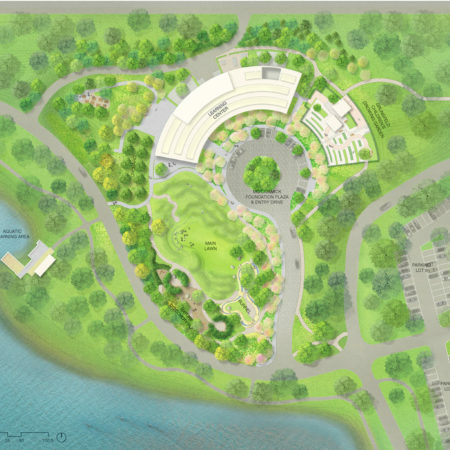 This six-acre horticultural campus serves a vibrant community of families, offering an interactive experience with the natural world, while advancing the institution’s influence as a science and horticultural center that serves more than 125,000 people each year. 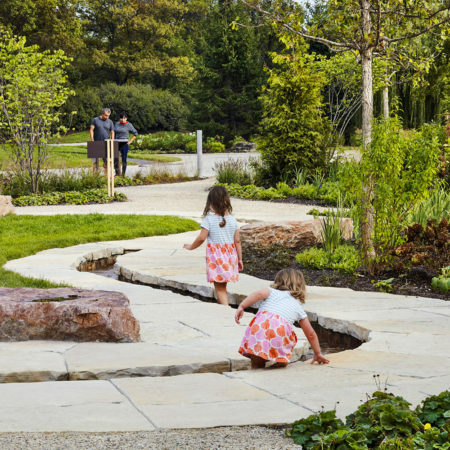 As nature becomes an increasingly distant concept for children plugged into the digital environment, the campus encourages direct engagement with plant life, and the natural cycles of nature in order to reconnect our youth to the ecological world. 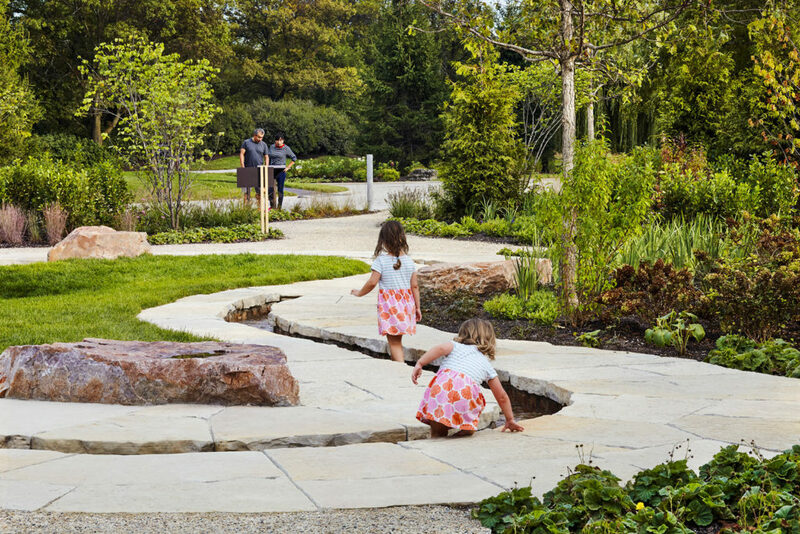 As the idea of “getting dirty” in the outdoors becomes more of an abstraction for children, the garden is designed to highlight process, transformation, and creative discovery in this four-season landscape experience. 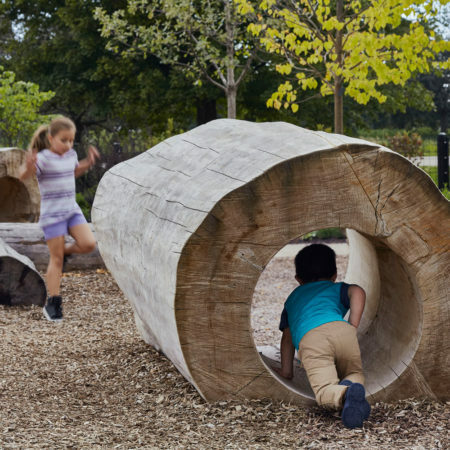 The design immerses families and children of all ages to a variety of outdoor experiences that include inquiry focused learning and play that engenders a deeper understanding of ecological systems. 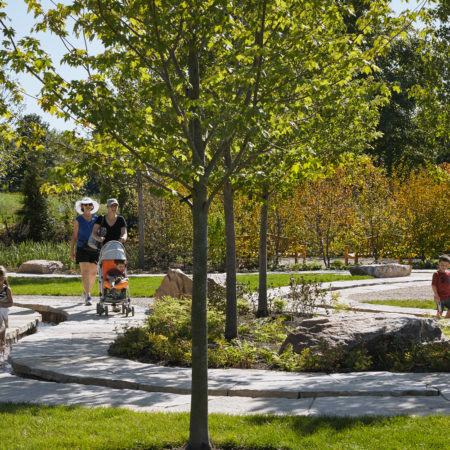 The expansive garden includes a variety of natural experiences and explorations as visitors weave through the grassy mounds, water-play runnel, boulders, diverse woodland plantings and willow tunnels. 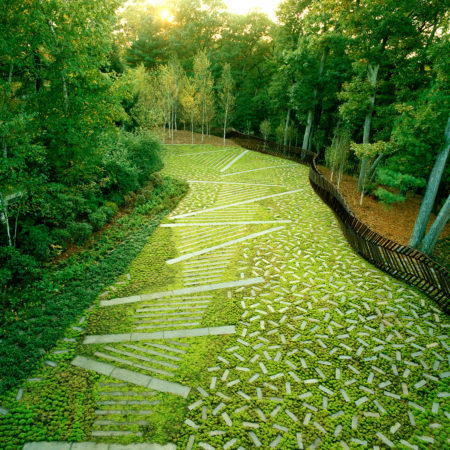 This regenerative project is envisioned as a gateway to the natural world; one that highlights creative discovery throughout the year. 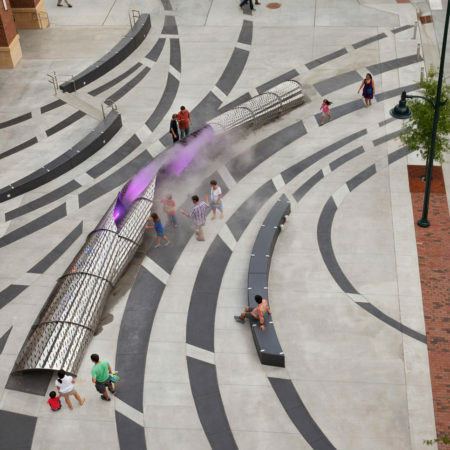 Located in the heart of downtown Chapel Hill, the 140 West Urban Plaza is the first development project in a larger masterplan initiative to invigorate this college town with greater pedestrian oriented landscapes. 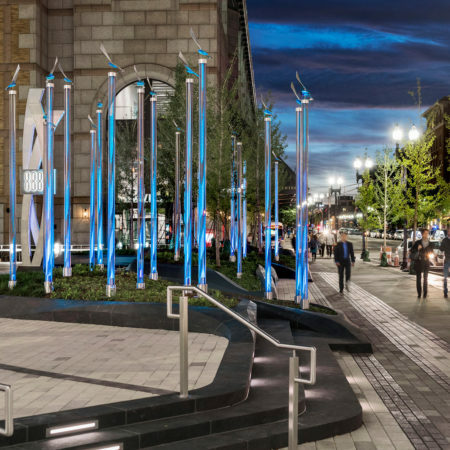 Framed by a mixed-use development that creates a commercial link between north Rosemary Street and the downtown restaurant district, the plaza at 140 West is sited at an important node based on the analysis of pedestrian connectivity in the Streetscape Masterplan. 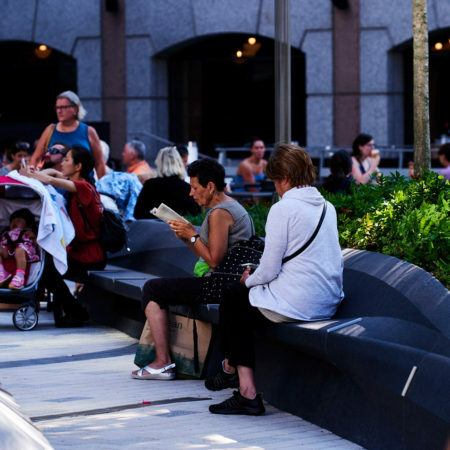 The plaza space is designed to encourage multi-generational engagement with a centrally located mist fountain that both defines arterial connections through the site and entices pedestrians from the main street towards this plaza that offers a much needed cooling amenity during the summer. 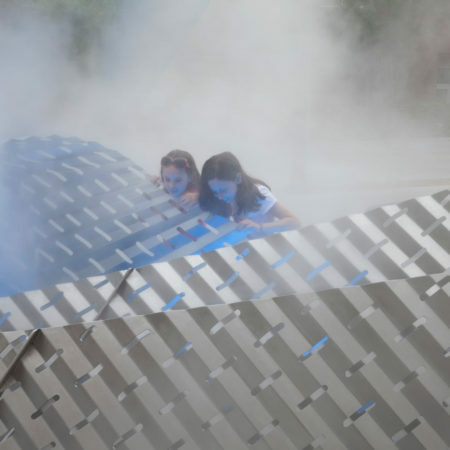 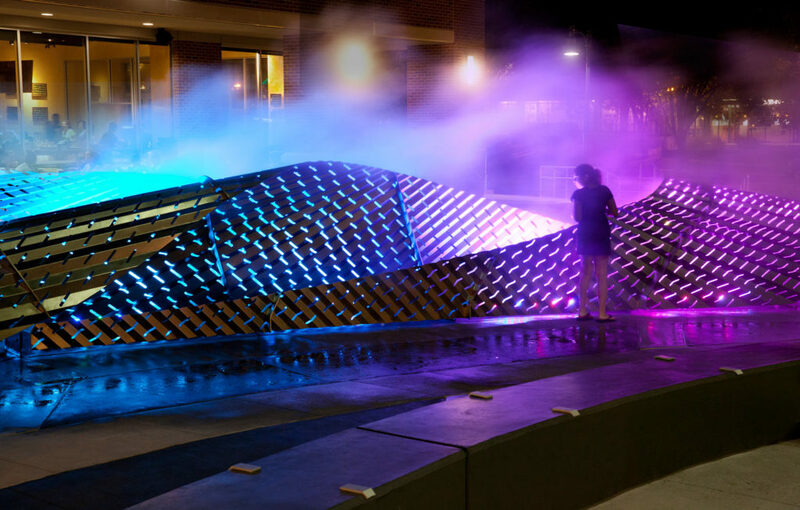 The design celebrates the dispersion and evaporation of water, expressing the hydrological cycles of the environment. 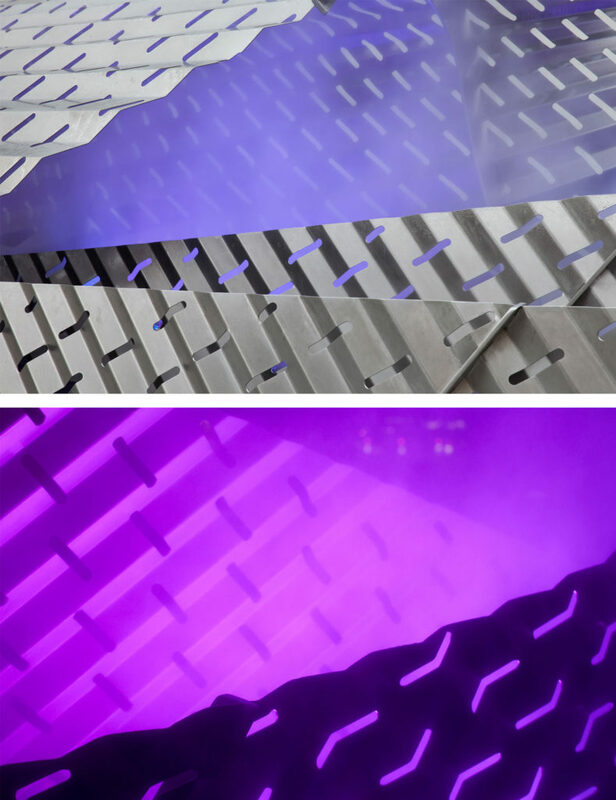 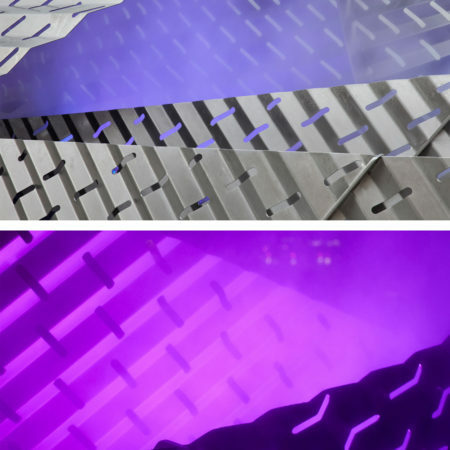 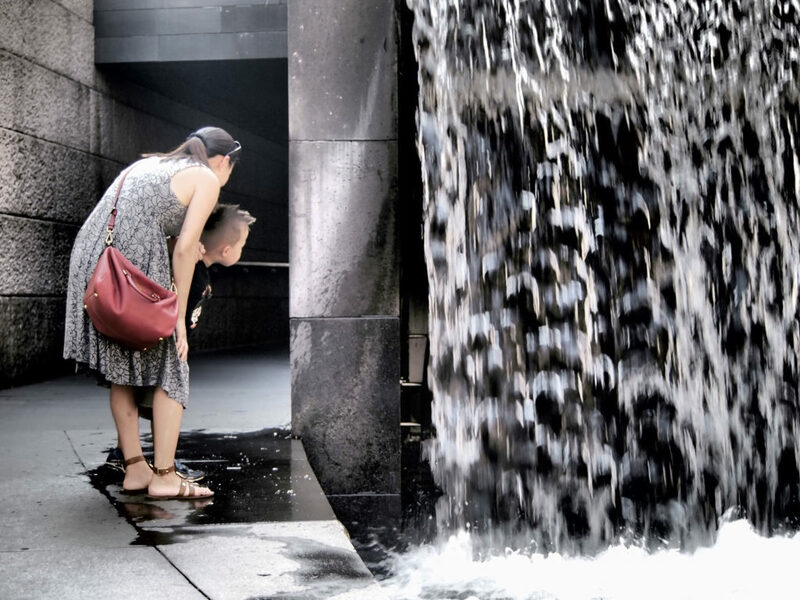 The stainless-steel surface of Exhale, the central fountain, becomes the transformative moment of hydrology from liquid to a gas, cooling the ambient temperature. 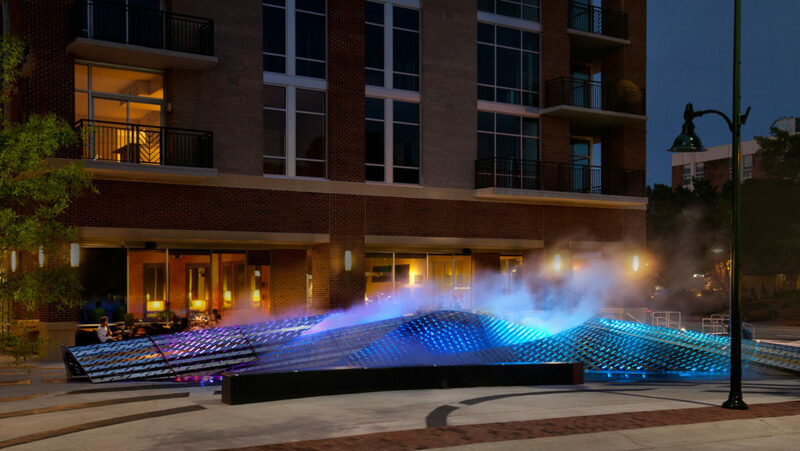 The fountain breathes color and ephemeral mist from one end of the plaza to the other, offering pedestrians incentive to stop, play and watch the choreographed light and hydrological play. 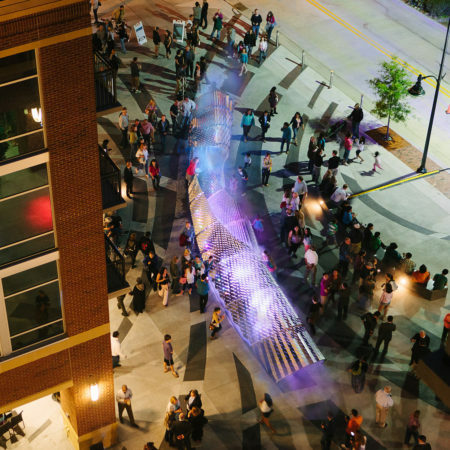 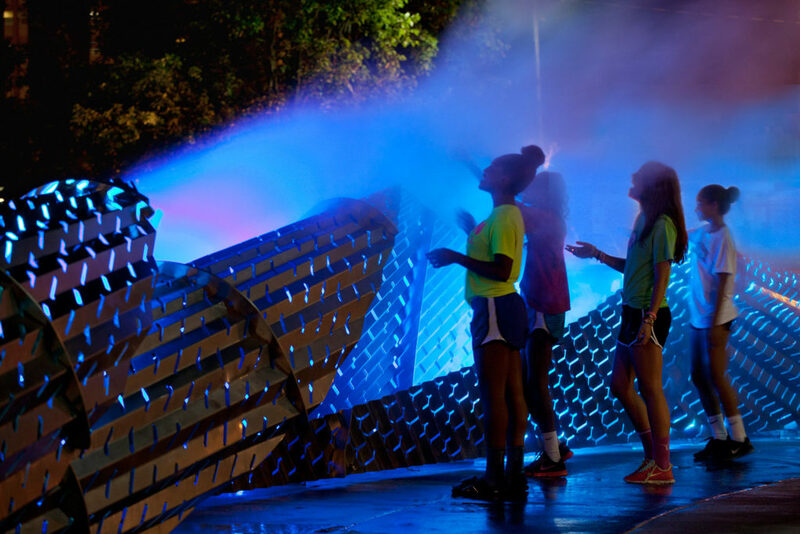 At night, the plaza becomes a dynamic space with a choreography of color and hydrology that infuses the plaza. 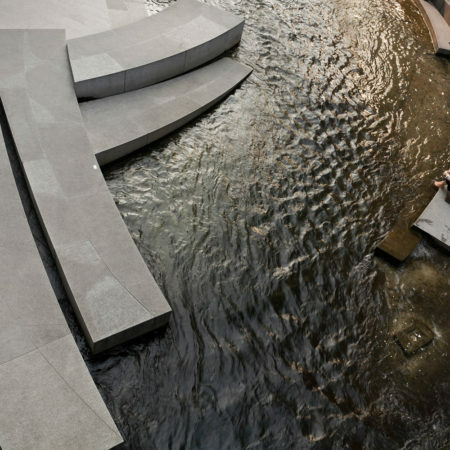 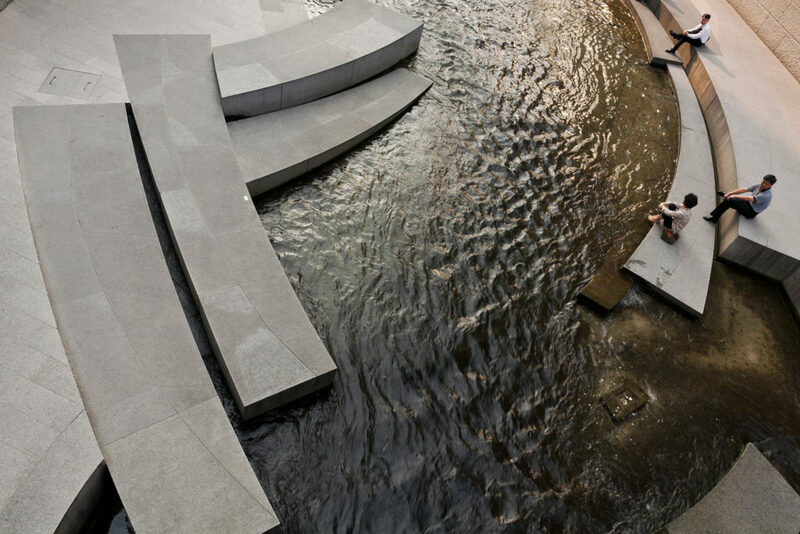 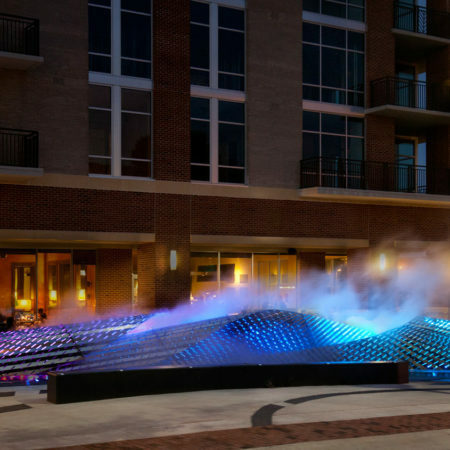 Through this restorative project, the design team developed an inventive design that expresses the hydrological cycles within this urban plaza. 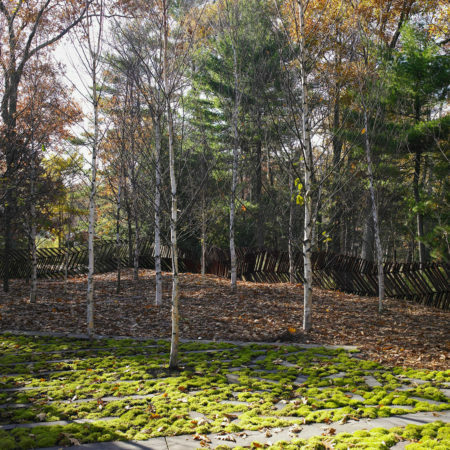 This project is situated within a three-acre native hardwood forest overlooking Farrar Pond, one of the many ponds linked to Walden Pond: Thoreau’s historic home in Lincoln, Massachusetts. 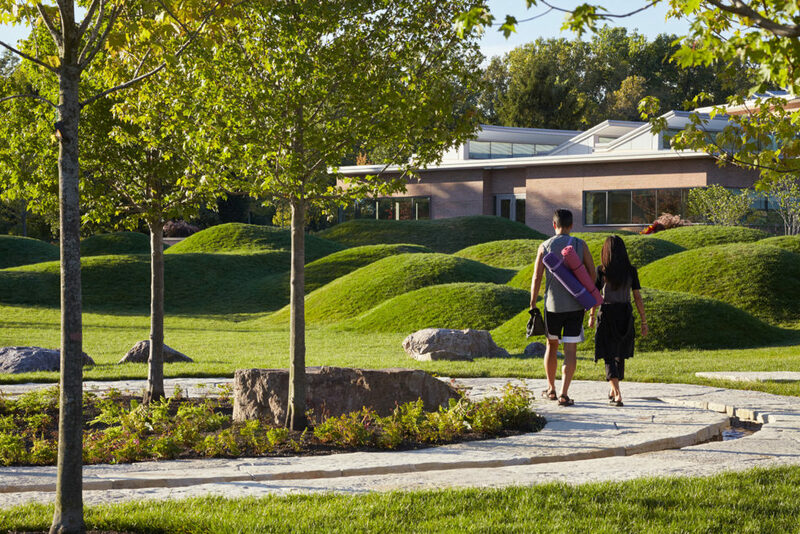 The design intent is to harmonize contemporary materials and design elements with this native plant palate and natural kettle and kame geology. 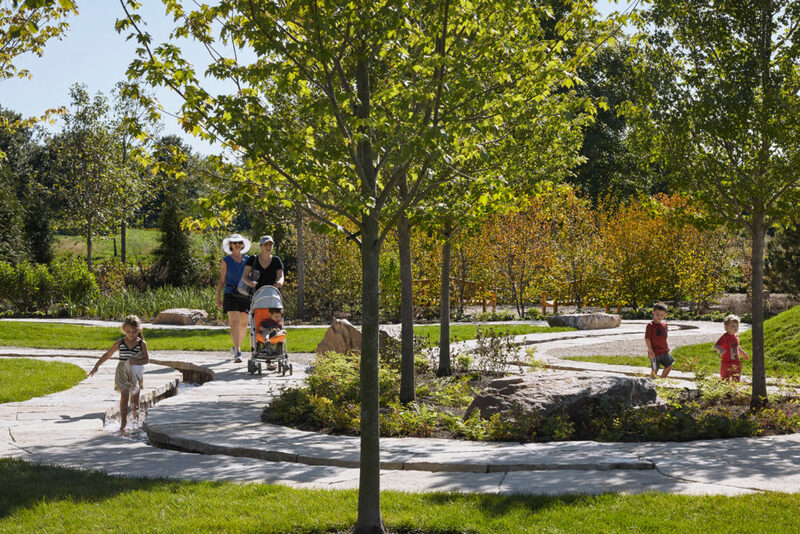 A rich tapestry of native plants that transforms over the seasons weaves seamlessly with the existing forest, defying conventional high maintenance plant choices by opting for options that do not require chemical maintenance or irrigation systems. 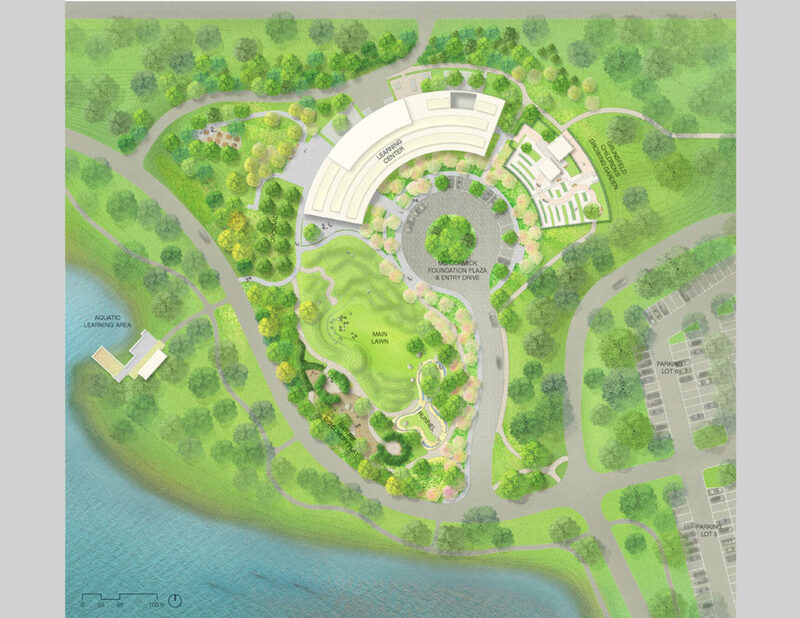 This design choice seeks to enhance the natural beauty of the site by utilizing vegetation that will protect the existing ecological and watershed conditions. 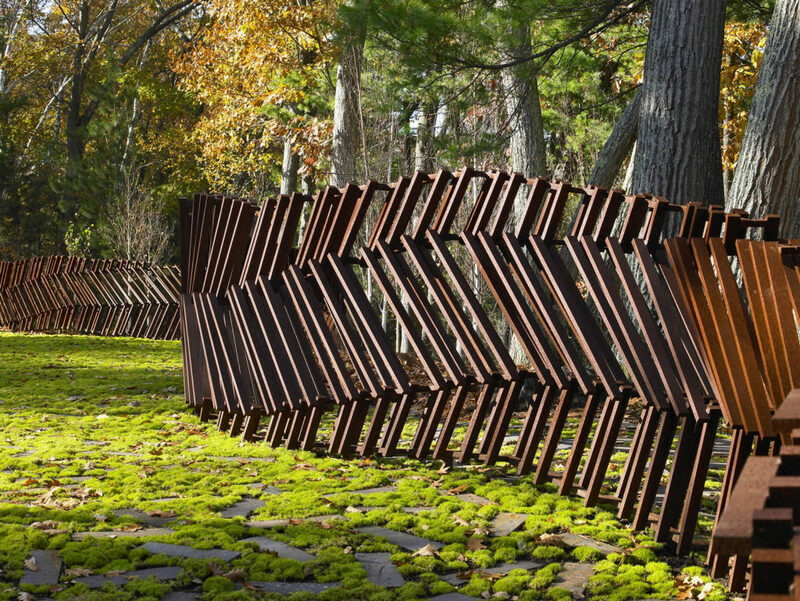 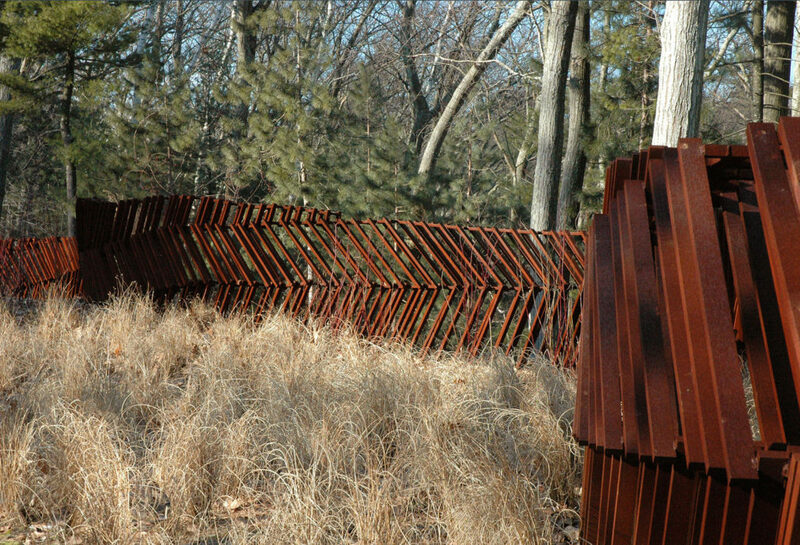 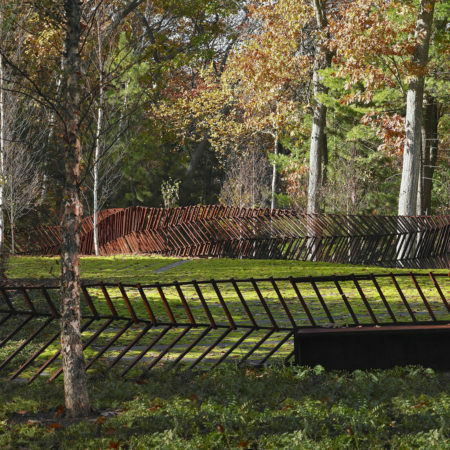 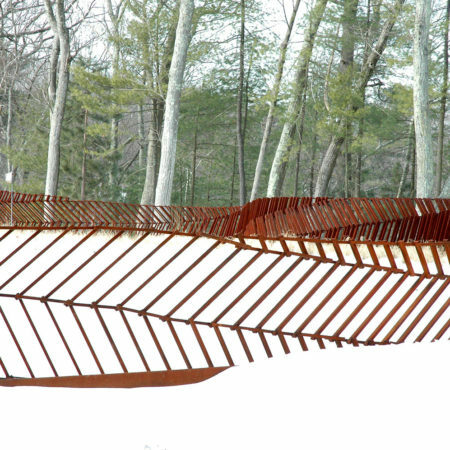 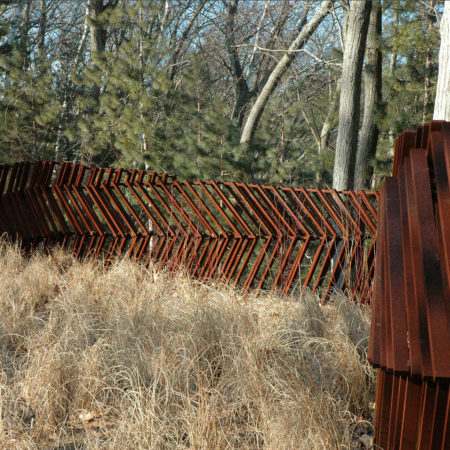 The sculptural fence flows through openings in the native hardwood forest and over various ground plane materials, both defining and blurring boundaries. 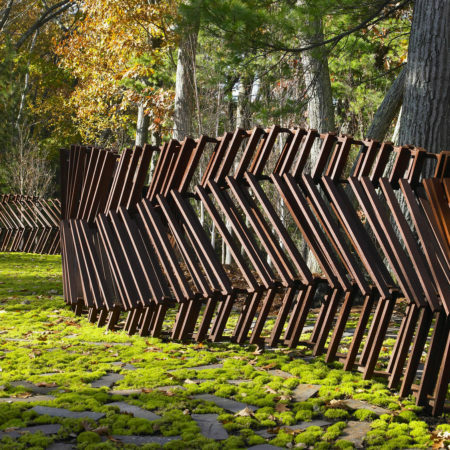 CorTen steel members are stacked to create a dynamic form that both contains and defines the property. 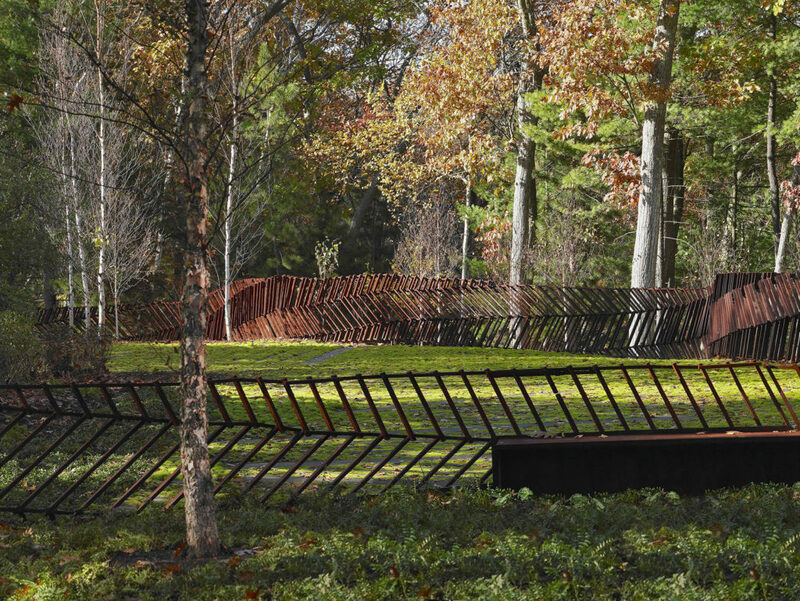 Conceived of as a flexible structure, the sculpture was formed on the site and opens and closes with the transformations of the groundplane. 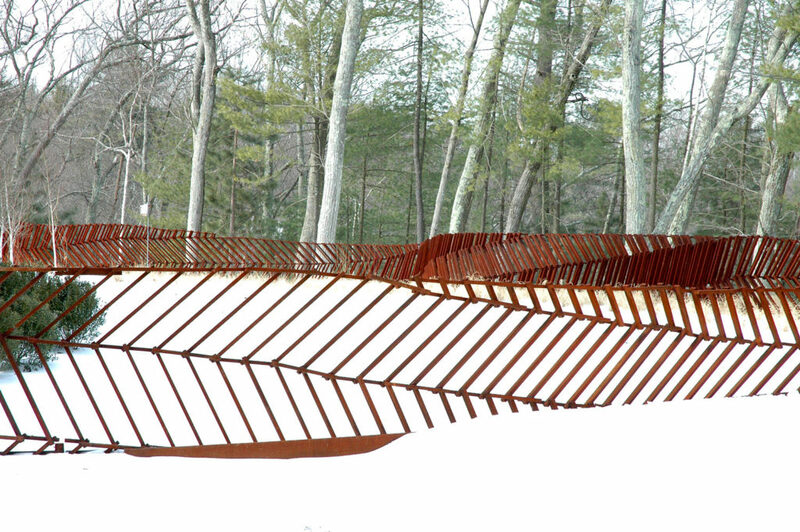 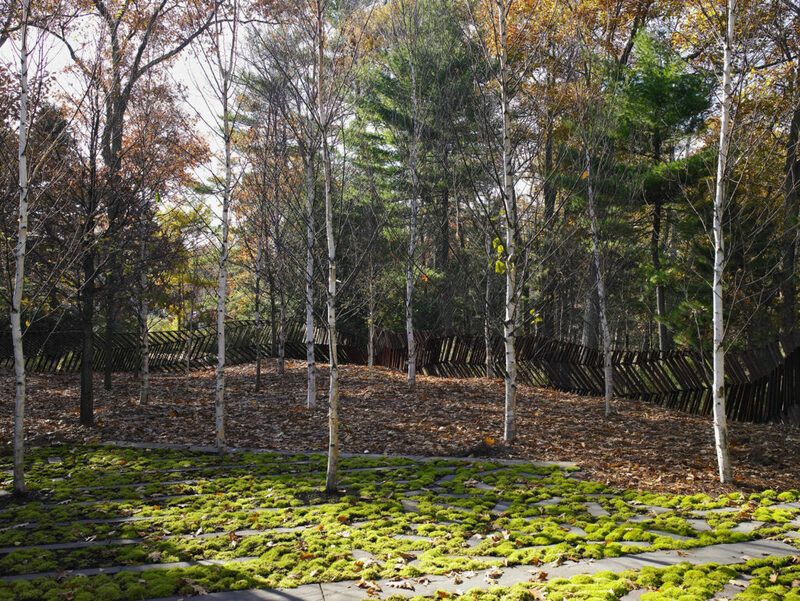 The project maintains the resonant qualities of this New England forest landscape and the town’s strict land stewardship bylaws of watershed protection and dark sky requirements, while asserting a contemporary constructed language that speaks to the client’s interest in art and sculpture.